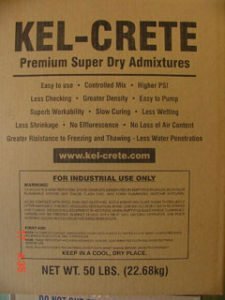 Kel-Crete Premium Liquid Admixture is a NON-TOXIC admixture that provides WATER REDUCING, PLASTICIZING, AIR ENTRAINING and GELLING functions for the PLASTER, STUCCO, SHOTCRETE, MASONRY, GUNITE, CONCRETE etcetera mortar ndustries. Except for shotcrete and concrete, the Kel-Crete is normally induced at the job site. Kel-Crete admixture is a replacement to HYDRATED LIME and SILICA FUME. Kel-Crete meets EPA LEEDS and CARBON FOOTPRINTING standards. The product is packaged four gallons to a case, or in 55-gallon drums. 1. Plant Blending: Blend 8 to 12 ounces of Kel-Crete Premium Super Dry by weight per 7 sacks per cubic yard. Due to the fact that such a small amount is required the mix may need to be blended 5 to 10 minutes longer than other admixtures. 2. Job-Site Blending: Blend 8 to 12 ounces by weight per cubic yard of Kel-Crete Premium Super Dry into the dry blend mixer. 3. 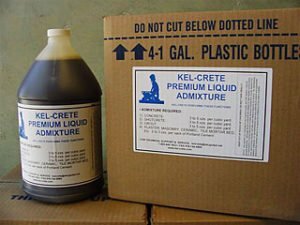 Job-Site Mxing: Blend 4 to 5 ounces of Kel-Crete Premium Liquid Admixture into the required per-cubic yard of water reservoir/tank. 2. Greatly reduced rebound/material waste. 3. Able to increase gunite thickness per application. 6. Greatly reduced materials and labor costs. 7. Replaced use of costly silica fume. 8. Very pleased that Kel-Crete is non-toxic. Both liquid and dry admixtures meet EPA Leeds and carbon footprinting Standards as non-toxic admixtures made in the USA. 51 years Without failure. For more than 50 years Kel-Crete Premium Liquid Admixture has been a leader in the plaster, masonry, shotcrete, concrete, etc, admixture industries. Test reports support this fact! Test reports (PDF) under “Test Reports”.